I’ve definitely had a hot-and-cold relationship with rugged waterproof cases for my iPhone 5. While I've had a lot of fun getting to torture test a few different units at a local waterpark, that all came crashing to a halt back in June. During a trial of OtterBox’s Armor Series, the case failed to protect my handset, requiring a trip to the Apple Store and a sympathetic employee to save the day. I vowed never to get the expensive phone near water again – case or no case. But the company has recently introduced a new waterproof option that piqued my interest. Instead of a massive enclosure like the Armor case, the new Preserver Series for the iPhone 5 is slim and sleek, looking very much like something from LifeProof. Maybe not coincidentally, OtterBox purchased their rival back in May. The Preserver’s design is simple and easy. It is made of two pieces of solid polycarbonate – a front piece that contains the screen protector and a padded back part that snaps onto the front. After placing your iPhone in the front piece, you line up the back piece and snap it in on the top, bottom, and middle. Each part snaps together with a firm noise, and there’s basically no way you’d question whether the case is installed correctly. 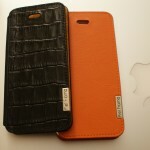 I took a look at the black version, but the case is also available in three other color combinations. The speakers, microphone, and headphone jack on the bottom of the handset are protected with two strips of heavy molded plastic. Just like the case itself, it’s readily apparent when the pieces are fully closed. I’ve used the case for a few weeks, and it’s really easily to hold. The power, volume, ringer, and home buttons are all covered with thick plastic, but they are easy to push. Small openings allow the camera and flash to operate. Thankfully, the case didn’t seem to cause any issues while taking photos with or without a flash. And while I didn’t conduct any real-world waterproof testing with my phone inside, I was able to do the next best thing. I put the case together without a handset and tested it in a bathtub for 30 minutes. There was absolutely no water inside of the case. I also did a few quick drop tests from about 3 feet onto a tile floor, and the handset was just fine. 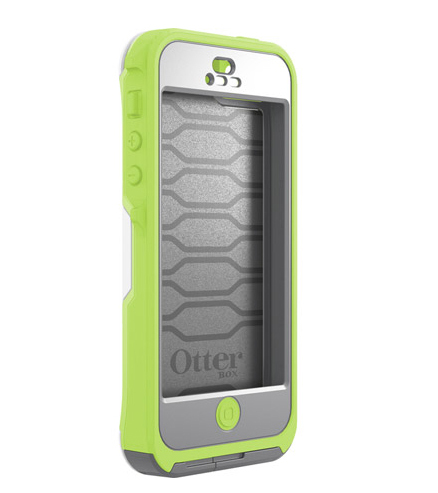 OtterBox says the case can protect from drops of up to 6.6 feet. Even the dreaded screen protector is unobtrusive on the Preserver Series. It lies completely flat, and I found no delayed response after touching the screen. There was next to no reduction in clarity of the iPhone 5’s Retina display. The only major gripe with the case I could find was during voice calls. Like other cases in the same category, a thin waterproof membrane covers the microphone and receiver. So, at times, voice callers sounded muffled. And I was also forced to speak a little louder than normal for callers on the end of the line to properly hear my voice. Thankfully, in speakerphone mode, callers came through just fine. And music played through the speakers sounded nice as well. Also, be prepared to only use Apple’s Lightning cable when charging your phone with the case on. The hole for the Lightning plug is very slim, and a few third-party cables I own didn’t fit. Screen protector is actually unobtrusive. Waterproof for 30 minutes in up to 6.6 feet of water. Can withstand drops of up to 6.6 feet while still protecting the iPhone 5. Attachable lanyard is a nice addition. Voice calls do sound muffled. Third-party Lightning cables sometimes don’t fit. I’ve got to hand it to OtterBox. The Preserver is really everything a waterproof case should be. It's easy to install, and almost feels as slim and light as the company’s enormously popular Defender Series. I’d definitely recommend it to anyone looking for a rugged case that will make it make it through the occasional water hazard in life. The only thing that could make the case better would be for OtterBox to provide some type of warranty against water damage. LifeProof offers an optional total water protection program that can be added for $10. And Incipio’s Atlas case includes a one-year warranty against water damage. If OtterBox would take either of those paths, even I would have no problem getting my protected iPhone 5 near water again. Hopefully, the cases options for the iPhone 5s and iPhone 5c will be available soon. I’m very interested to see how the well-reviewed Touch ID capability will work with the 5s version of the case.